If classes are full when you try to book please let us know that you are waiting as we sometimes get last minute cancellations. Our studio is not massive and we often get full and like to make sure everyone has a little space around them so it really is important to book in advance. We don't want to dissappoint you so please do book before turning up. Sometimes classes have to be cancelled at the last minute and we don't want you turning up to closed doors and worse sometimes classes are full and we feel really bad if we have to turn you away. If you are buying for a friend or as a gift please buy in the normal way registering in your friends name then ask you friend to ring to activate their account. 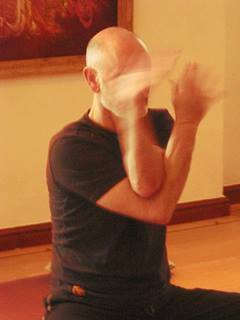 Barry Todd is a registered SYT (Senior Yoga Teacher) with Independent Yoga Network This accreditation de monstrates excellent standards as set by Independent Yoga Network. 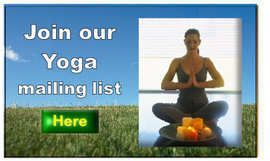 Are you interested in deepening your yoga practice? We enjoy a relaxed atmosphere with small classes - you will never find more than 14 in a class - so lots of individual attention if you want it. 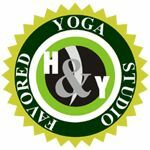 The styles we currently offer are Hatha, Vinyasa, Yin You will find a brief explanation of each here and even better, why not try each and see which suits you best best. All our Yoga, classes with the exception of Yin, begin with a short period of relaxation followed by warm up poses. 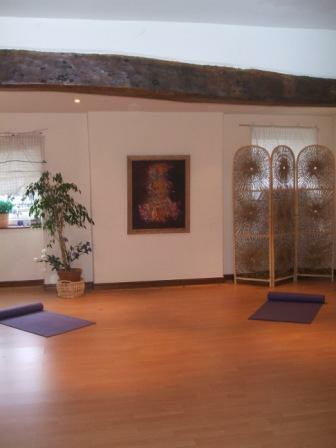 You can then expect a series of postures lying on the mat, standing, balance work and sitting. Breathing and using breathing in posture is included in all the classes. At the end of the class there will be a period of relaxation which might include yogic breathing techniques and various relaxation/meditation methods. Sometimes the end relaxation is extended to include guided relaxation and meditation techniques - usually that is indicated on the class description or included in the weeks programe as a special class. The relaxation at the end of the class can be experienced in many ways. Those who find it difficult to relax may not benefit from it straight away. However, after you have been coming for a while it is usual to occasionally feel as though you have drifted off into a deep sleep, yet you are still aware of where you are. That is a sign that you are in a deep relaxation and very occasionally it may be that you have fallen asleep. Not sure which class style is for you? For advice or to discuss email [email protected] or text 07926 030890. Click here for a description of the classes currently on offer or due on the programme soon. Equipment - no need to bring your own mats or blankets whilst you are trying it out, we have a supply in the studio, although you are welcome to bring your own if you prefer. If you are coming regularly you may choose to build up some other equipment like bolsters, blocks etc. although there are many people in the classes who do not have lots of equipment and we can improvise. Some people prefer to use specialised yoga towels to cover the mats and help with slipping but it is not essential. What to Wear - nothing special - just loose fitting trousers and a comfortable T shirt will be fine. If you want to wear specialised yoga gear that's fine too. Everyone is welcome to our classes and workshops whether they attend another class but want the extra practise at the weekend or are attending one of our classes during the holidays when their regular class is closed. Attending our classes You do not have to attend the same class each week and can mix and match. The most convenient for most is to book on line. Once registered, you can select which classes you want to attend and also cancel* your booked classes. Alternatively you can telephone and book. Please read the T & C below and note specifically that classes booked can not be credited for refund if cancelled within 1 days prior to the class.*. * If you book a class and subsequently cancel for any reason that class still counts for your block. You can attend any and as many classes as you wish providing you have the credit on your block. All payments are in advance and non-refundable. . If you love Yoga and simply can't get enough of it we've got just the thing for you. As a member you pay a monthly subscription for unlimited classes each week. Here's the real news though. If you recommend a friend who also becomes a member you get £5 per month for as long as they are members. You can do this as many times as you like - so 8 friends would mean free classes for you. See below for more details about membership. For those who regularly like to attend at least two classes per week, we have a great option. Pay £60 per month and come as many times as you like the only limit is your time (classes subject to availability)* So you could be attending 20+ classes per month! **All Yoga class members (except drop ins) are entitled to a discount of 10% off any goods bought in the reception shop and at least 10% off most therapies that we have on offer including gift vouchers. This includes those making block payments. Occasionaly we will put on a themed class on our regular class slot. You will find information about this on Special classes on the menu and classes will be included on the online scheduler. Most of these are included in the membership options. Restorative Yoga a very specific and personalised style of Yoga to deal with health and well being issues and good for those with limited energy or movement as well as more agile people wanting to develop a complete sense of well-being. These classes can also be by arrangement for an individual or small group and involve more support and individual attention from the teacher. Please enquire if you are interested in this class. Yoga for Sports Support Subject to demand we also offer classes for Golf, runners, cyclists, swimmers, cricketers, gym workers. Some sports can lead to physical imbalance because of the repetitive movements involved. Yoga can help restore this imbalance. Offered at our studio or insitu. Please enquire if you are interested - offered to individuals or select groups. We also offer Yoga to support specific groups i.e. weight loss, stress, anxiety. These classes are usually delivered on demand for groups. We have room for guest teachers and additional yoga teachers offering a contrasting discipline. Please contact us for details. All offers and discounts below are not valid with any other offers. Payment for your classes is required upon booking and booked classes subsequently cancelled or not attended are not subject to refund or credit. The exception is if you give 5 full days notice of cancellation your account will be creditted with that cancelled class. CANCELLING USING THE ON LINE SCHEDULER ONLY if you cancel a class giving 60 hours notice it will be treated as an early cancel. Yoga blocks: A 10 week block expires 12 weeks after the first class and a 5 week block expires 6 weeks after the first class. All classes should be prebooked at least one week in advance. No credit or refund is given for cancellation or non attendance. Block are non-transferable. Bookings can be made up to 30minutues before the start of a class. You can use your block to pay for a friend - just choose two or more spaces on the booking form. 10 classes to be used over 6 months. These classes can be used at any time provided they are used before the 6 months expiry date. Monthly subscription to yoga classes : Unlimited class attendance. Classes are subject to availability and you need to book onto classes before attending. *We guarantee that at least two classes will be available per week and if we are unable to deliver we will refund £5 for each class that we did not deliver (up to a maximum of two per week). This refund is not class specific or subject to your availability. Retreat: Deposit to secure your place is non refundable and forms a comitment to pay the balance by the due date. If you have to cancel we will try to find a replacement and will refund as much of your balance as possible according to how much discount we have to offer to sell your booking. Your personally identifiable information is kept secure. Only authorised colleagues and contractors (who have agreed to keep information secure and confidential) have access to this information. All emails and newsletters from our sites allow you to opt out of further mailings. Mind and Body Therapies Ltd and Mind and Body Yoga Studio will never sell, trade, rent, exchange or otherwise share your personal information with any other person, company or organisation. I really enjoyed the class- please thank Barry for me -& I slept really well which is novel. Can't wait for next week.